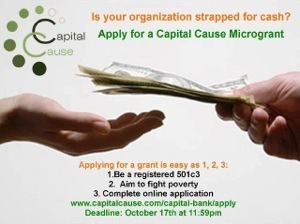 Apply for a Capital Cause Microgrant! Is your nonprofit doing work to address the issues of hunger, homeless and poverty in the DC Metropolitan area? If so, your organization may be eligible to receive a Capital Cause Grant! Capital Cause is pleased to announce its second grant cycle of the 2012 year! Capital Cause is an organization that invests young professionals in philanthropy through collective giving of monetary donations (Capital) and time (Cause). Since 2009, Capital Cause has awarded nearly 20 microgrants to deserving nonprofits across the Washington Metropolitan Area, and your nonprofit could be next! During our second cycle, Capital Cause will award monetary grants focusing organizations that aim to eradicate poverty. The deadline to apply is Wednesday, October 17th at 11:59pm. Please send any questions, comments, or concerns to Darla Bunting,Capital Director, at capital@capitalcause.com.